Stomach ulcers, often called peptic ulcers, are painful sores that develop in the lining of the stomach. They occur when the thick layer of mucus that protects the stomach from digestive juices is reduced, thus allowing the digestive acids to eat away at the tissues of the stomach lining. Peptic ulcers usually form in the stomach, however they can also develop in the small intestine (a part called the duodenum) or the esophagus. Stomach ulcers are a common problem. One in 10 adults can expect to deal with painful ulcers at one point or another. According to the American Gastroenterological Association, an estimated 4 million Americans have peptic ulcer disease. No single cause has been found for stomach ulcers. However, experts report that an imbalance between digestive fluids in the stomach and duodenum can cause an ulcer. Most ulcers are caused by an infection from a type of bacteria called Helicobacter pylori (H. pylori). Other causes include long-term use of nonsteroidal anti-inflammatory drugs (NSAIDs) and excess acid production (hyperacidity) in the stomach caused by gastrinomas or Zollinger-Ellison syndrome, a rare disease. For many years, it was believed that high stress led to increased production of stomach acid, in turn causing a stomach ulcer to form. However, stress is not the cause, but it is a risk factor. Along with stress, other factors that increase your risk for ulcers include excessive drinking, smoking or chewing tobacco, family history of stomach ulcers, being over 50 years old and radiation treatment to the area. 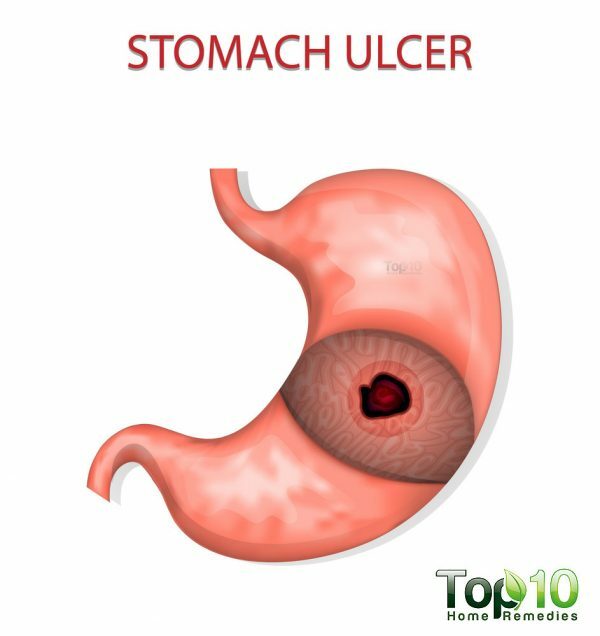 It’s important to promptly treat an ulcer, as when left untreated, the acid can eat into the stomach wall, causing perforation and bleeding. This is why it is important to know the signs and symptoms of an ulcer, so you can get a timely diagnosis and treatment can be planned out. As sores occur on the stomach lining, one of the most common symptoms of a stomach ulcer is pain in the stomach. The pain can be felt anywhere between the breastbone and belly button. The pain is often described as dull, achy or a burning sensation. This type of pain is usually caused by the ulcer, but it may be aggravated by the stomach acid when it comes into contact with the ulcerated area. Depending upon the severity of the condition, the pain can last for a few minutes to several hours. Also, the pain can come and go for days or weeks. The pain can also get worse at night and feel worse when the stomach is empty. The pain feels better temporarily after eating a small meal or taking an antacid. However, keep in mind that stomach ulcers are not always painful. At times, people suffering from this problem do not experience stomach pain but may experience other symptoms. Heartburn is usually a symptom of acid reflux disease, but it may also be associated with a stomach ulcer. If the burning sensation in the chest begins to subside with water or an over-the-counter antacid, then it is not a matter of concern. However, consistent heartburn, regardless of what you eat, may indicate a stomach ulcer. Heartburn due to an ulcer also causes you to burp or hiccup excessively after eating. As heartburn causes a lot of discomfort, see a doctor to find out the exact cause and treat it immediately. Bloating is another initial symptom of a stomach ulcer. People who have an ulcer often complain of a feeling of bloating, specifically in their midsection. Bloating accompanied by abdominal pain, swelling in the abdomen and a feeling of fullness may be another tip-off to this condition. You may also have the urge to burp a lot more often than usual, even without eating anything. Unexplained abdominal bloating continuing on-and-off over a long period of time is never a good sign. Consult your doctor about the problem immediately.